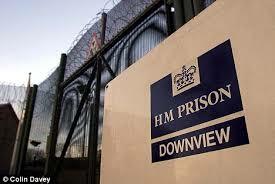 We travel at dawn from London Victoria station toward Sutton and my visit with the women of HMP Downview. With me is Charlie Weinberg, the Director of Safe Ground, the arts organisation who made my masterclasses in prison possible. Joining us is Sarah Hartley from NOVIS, a group that provides education and resources to inmates. Both Charlie and Sarah working together is what has made my visit possible. I’m a patron of Safe Ground and choose to be because it provides some of the most creative, caring and innovative projects with the prison system – and works toward supporting relationships, literacy and learning both within and without. You can find them here. From the outside the prison looks like a post-apocalyptic Butlins, bleak low rise huts with pebble-dashed walls and a grey expanse of playground on which no one plays. Inside is another matter entirely. The officers who greet us are warm and engaging, friendly and helpful. They lead us in to a large room in which the workshop will take place. Immediately we begin talking about our passion for education and creativity within the prison system. Recently, most arts elements to study have been reduced if not entirely cut. So a visit from a poet is welcome. While 11 women have signed up to participate in the masterclass double that number walk in. This is a common experience for me when working within the prison system. Those that might be disengaged from poetry on the outside find a connection to it when their freedom is removed. Perhaps it’s because poetry is a kind of freedom. Perhaps it’s because there is an escape tunnel dug deep within every book. Or perhaps, it’s because there is finally space without distraction to hear a poem with its full rich meaning. Ah yes. Right. That too. The women look at me. I look at them. There is a moment before every performed poem when there is only looking. My introduction covers my experiences growing up, leaving home and my current work as a poet and educator. They continue to look. I crack open a joke. It fizzes, someone swears and the workshops begins. It’s during the opening of Last Poet Standing – now so old that when I speak it my teeth curl up to get away from the words – that I realise I’m talking to friends. There are eyes, there are teeth and there are nods. They clap in a way that clears ghosts from the room and we settle in. I like to run impossible exercises – the 5 minute poem, the 5 minute rehearsal, instinctive writing etc. This is so they understand that what they are doing not many others could do, that even major published poets would struggle with the expectation and restrictions I place upon them. And then they smash it. And that is the first time in the session that they believe themselves. It also helps bring energy, laughter and glorious panic into the room. Everything comes from chaos, even you. Within 15 minutes they had a poem each and were preparing to perform it. One of my favourites from Downview were two amazing women who sat opposite me, who wrote a piece beginning with the line ‘She rattles the bars to her rib cage’ and turned into a wicked catchy little rap, complete with table beat box. Hard to keep your smile to yourself around people like that. Other responses to the first line spoke about body image, dysmorphia and eating disorders. Another wrote about being trapped within the body, and trapped within the wider body of society. My poem @The First Prison’ is inspired by this idea. The writing developed during the session was soul affirming and joyful, bitter and shadowy sad – a sad that has followed you for years, a broken dog of a sad that keeps trying to come home with you. The women read the poems out and respond to each other with a kindness that I have become accustomed to seeing in workshops where the participants are marginalised. There is a sense that every word is important, because it is finally spoken, it is finally real. It is owned. There is an alchemy created by poetry in these groups, an almost biochemical reaction in which the listener becomes a vital part of the poem, and not just the recipient of it. The women of Downview are strong in their words, and gentle in their responses. It felt like friendship. The moment when I asked them to write a canto based on their life stories will remain with me. Some were already writing before I finished the instruction. Others began to stare silently. A couple just sighed and began talking to each other. I think that tells me everything I need to know about their life stories. The ones who did write and read out spoke of early childhood trauma, from sexual abuse through to the sudden loss of parents, and that too will remain with me. Some of those poems appear below. Others cannot. I have a feeling that the most important writing created as a result of the masterclass was written back in the cells. I hope they keep writing. I hope they understand that a poem never ends. This is just one part of it. One scene in the canto. When they write the next part they will be on the outside again. A part of the power of poetry is in the form, another is in the words themselves. Another part is in the alchemy of sharing, whether in a small room or on large stage. But the most important part is that those who once believed they were stupid, were failures in the traditional education system, start to understand that they may have been let down by that system, that they themselves may not have been the problem. They begin to understand both their own power and the infinite possibilities for the future. Poetry will not save your life. It won’t jump from a burning boat into the sea after you or dive in front of the careering bus to protect you. But it will help you to have an honest conversation with yourself and through that the whole damned world can change. Life Story writing using the canto form can be unusually empowering, allowing the writer to reduce events that feel overwhelming to a series of small distinct scenes or moments, as though the poem were the storyboard to a short film script. The form encourages brevity and nuance, and a strong visual poetry. I fell into cantos thanks to Anthony Anaxagorou. I read him a long poem, broken into smaller parts that added to the whole narrative, and he in turn introduced me to the form. He also signed me to Out Spoken Press, who I will be releasing the collection Songs My Enemy Taught Me with. The title poem is the canto, so you can see why it has become a transformative form of writing for me. And so I’m passing it on. Look for the blank spaces. They are where the stories are.